I really feel like I’ve regained my focus when it comes to knitting. I’ve completed half of my Christmas knitting. I’m still up in the air about knitting dishcloths for neighbors. I know Lily and Cream is readily available, but I don’t alway find colors that I like. 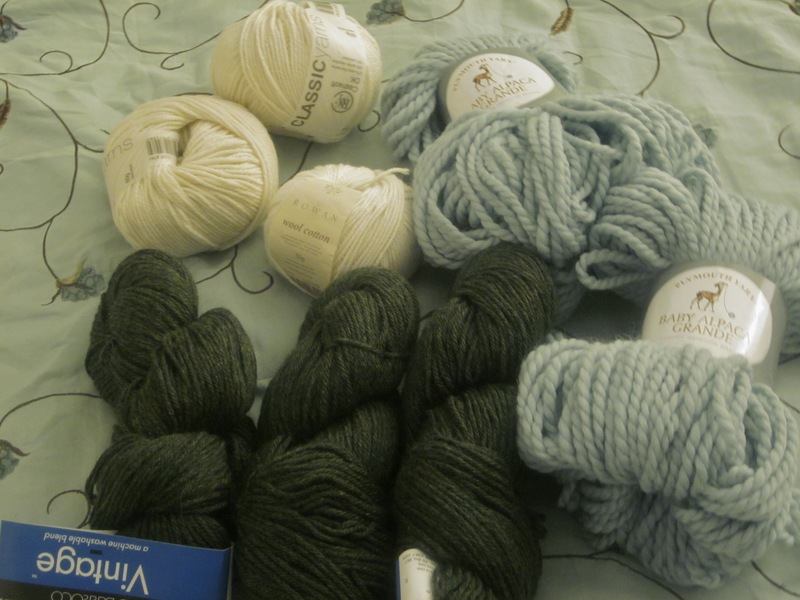 I’m hoping to find some different cotton yarn to use. Any suggestions? 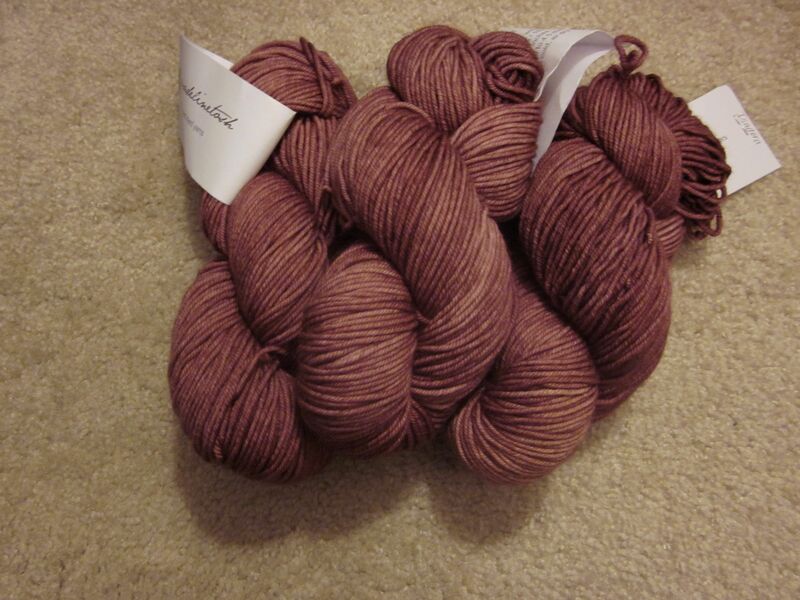 I got this lovely Madelinetosh Tosh Vintage in Isadora from Eat Sleep Knit. It looks like the yarn was soaked in a beautiful red wine. I plan on using it to knit up Mara with it. I haven’t done a lot of shawl knitting, so this one looks like a good one to do. I haven’t had the faith in my ability or the nerve to take on many of the projects that I want to knit. That’s why I have so much of a stash and so few knitting projects actually completed (unless we’re talking scarves). I’ve just got to get past that. I’ve never knit socks, I’ll admit that right now. The reason? I’m afraid of screwing it all up (perfectionist much? Yes I am). I mean, its not the end of the world when you screw up knitting. It can always be frogged and started over. I know this, but I still can’t get it through my thick skull. You know, one of these days I’ll be a bit less thick headed and thin skinned and I’ll be an unstoppable knitter. I’ll have finished projects coming out of my ears! Last night was another night of no sleep for me. I’ve got too many projects and worries hanging over my head that sometimes I just can’t settle down. Personal problem, I know. This night, instead of playing on the computer, I broke out the needles, grabbed some yarn and got started on one of my Christmas gifts. And its nearly finished! 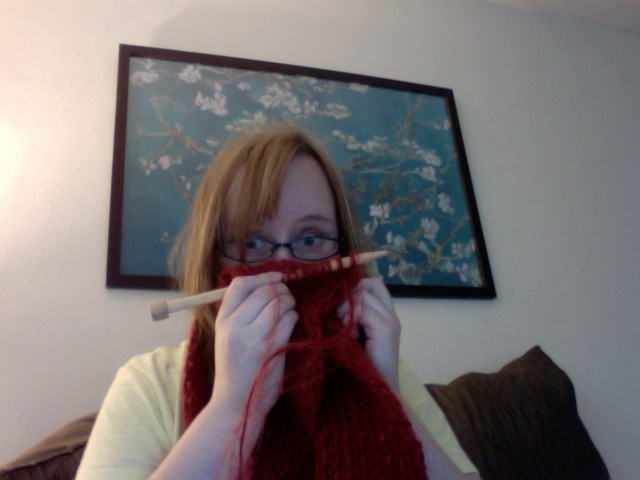 Its a simple k1p1 rib scarf so it should be quick, but I figured I would fall asleep for sure. If I keep up at this rate I can probably get everything done in less than a week. 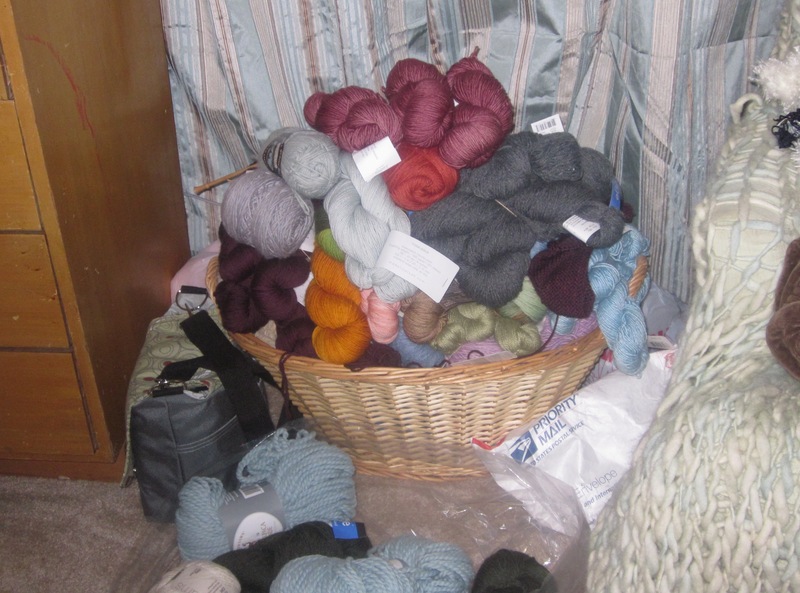 That is, once all of the yarn arrives. Still thinking dishcloths (and cookies of course) for neighbors. One plain, and one Christmas, maybe. I feel good about getting this blog started! Finally! It figures that as soon as I’m ready to start a-knittin’ again, I slice the hell out of my thumb. Its getting better so I think It might be time to start that Christmas knitting. No, I don’t have a lot of it luckily, but I do have some. One I want to do brioche knitting, but maybe that’s kind of silly to try to learn while working on a Christmas gift. Last year I didn’t knit any specific gifts, but I did do a lot of Christmas related knitting. I knit a big snowman, who is rather lopsided. I also knit a gaggle of little snowmen. They were fun and fairly easy to knit, Except that since I’d just picked up knitting again, my stitches were tight and hard to work with at the start. Plus I used to have a fear or knitting anything small, because it was, well, small is hard, right? No, not so much. I gave away the gaggle of snowmen to neighbors along with fresh, home baked cookies. Don’t you wish you were my neighbor? I’ve considered doing dishcloths for the neighbors this year. If I’m going to do that, I’d better get cracking. Only 77 days until Christmas! I’ve always loved yarn. Ever since I was a little girl I remember feeling the yarn in stores and wanting to do something with it. I had a weaving loom. Not likre a real deal thing, but a plastic one. I picked out a couple of skeins of multi-color yarn and went to work weaving doll blankets. I never was good at committing to the big projects. Years went by and I still felt that pull towards the yarn aisle in stores. Finally in the beginning of 2003, I decided to learn how to knit. My first knitting book was Knitting Pretty by Kris Percival. From that, I knitted the bookmark, the striped scarf, the long ribbed scarf, the change purse, the beer cozy, and a shoulder bag. Looking back that wasn’t bad for a beginner who was completely self taught. I went on to knit dishcloths and few other scarves, but I never had the nerve to try a sweater. I had myself convinced of that. I continued to knit this and that over the years. Nothing terribly exciting. Then last fall, something triggered in me. I came across a book called Fitted Knits by Stefani Japel. I looked through and thought “I WANT to knit sweaters like these.” A v-neck stood out to me. It was a top-down knit, and when I read the instructions, I didn’t get confused. I set out to find the Cascade Pastaza it was knit in. It took a little bit of digging but I found it. I didn’t knit that sweater though, I got some Madelintosh DK and knit the Tea Leaves cardigan, pattern from Madelintosh. I did eventually knit that v-neck sweater though, and I’m sorry to say the yarn was miserable and itchy. I haven’t actually completed a project in a while. I’ve got four projects on needles. I think I may pick one up and press on with it.